As I already mentioned in my kiwifruit pollination post, kiwi propagation from seeds is not usually recommended because it is a long and difficult process: much better results can be obtained with grafting and properly propagating kiwifruit from a mature plant that is already producing. Consider the fact that it takes about seven years for a seed to grow to a fruit-bearing plant, which makes the seed propagation process very time-consuming; add to that the disadvantage of not being guaranteed the traits of either parent, and you’ll quickly see why grafting is preferred. We will, however, explore both methods for the sake of information. Kiwifruits are usually grown from seed only in experimental plots to either produce clones, or to produce rootstocks that will later be used for grafting. You want to take budwood and remove the leaves, leaving about 1.25cm (half an inch) of the petiole of each leaf, and insert it into the rootstock at a height of 10cm (4 inches) with the shield or T method. When ready, you will want to cut the stock just above the junction. Bear in mind that both dormant cuttings and their roots usually undergo problems that make them unreliable: for maximum results they are usually treated with hormones and rooted under intermittent mist, but they don’t usually develop strong roots and can be attacked by crown-gall. The same also tends to happen when root-grafting: the union is susceptible to crown-gall which makes the process quite unreliable. 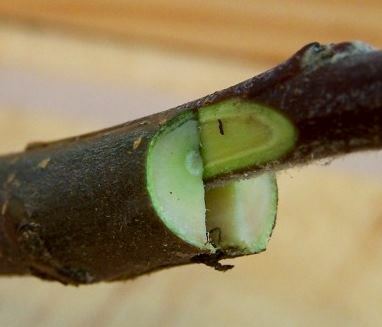 When an old vine starts to produce lower yields, your best bet is to cleft-graft before the new growth begins (it will otherwise bleed sap): you can do it with the branch of a male onto a female vine (which will enhance pollination) or do it in-vitro using the buds of female plants. As far as species are concerned, Hayward, Tamori males and Matua will root fairly easily, while California or Chico males will not root under periodic misting: they will have to be grafted onto seedlings.